The venue, Old Saint Paul's Church, lies in Jeffrey Street. I have walked this street loads of times, but never noticed a church, and indeed the facade was relatively nondescript, at least at street level. 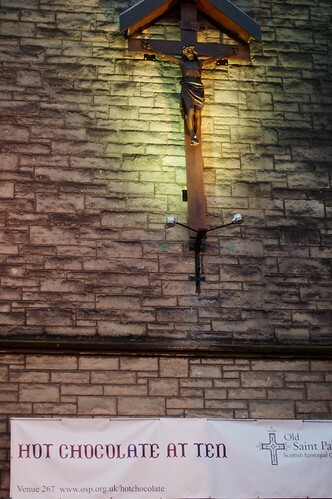 If I had looked up, which I have apparently never done, I would have noticed several tell-tale signs of a church, such as a huge, well-lit Jesus on the cross. In any case, I was genuinely surprised to find a very nice, and quite spacious, old church inside the small door in this not particularly nice street. And actually, as I look at Google Maps now, I can hardly see how the churh room we were just in could fit inside the building in the photo. The music tonight was performed by a woman, Philomena Moffat-Knox, playing the piano, and two young men, Jerome and Alex Knox, singing. I don't know if they are related to each other, though I'd say they probably are; I also don't know if they are related to John Knox, who by the way has a house named after him just around the corner from the church. The first part of tonight's programme consisted of three songs ("Leibesbotschaft", text by Ludwig Rellstab, and "Der Atlas" and "Der Doppelganger", written by Heinrich Heine) from Schwanengesang by Schubert. I can't say I've heard any of these before, but I enjoyed them a lot, and as I listen to different recordings now, I have to say the young man (Alex Knox, we think) at the concert certainly sung it better than some people who have CDs out. His voice was deep (baritone) and comfortable to listen to, and had an excellent ring to it. It really suited the venue perfectly. Also, while I found it hard to follow the text, it was obvious that he was really into what he was singing. Even though it was just him standing next to the piano, he performed it as I imagine he would have done if part of an Opera, with incredible facial expressions and the occasional gesture. At times he even leaned on the piano. Moving on, the next two songs were "Ein Mädchen oder Weibchen", from The Magic Flute, and "Se voul ballare", from The Marriage of Figaro. These I have heard before, and in particular Papageno's aria from The Magic Flute (which we saw at the Fringe Last year, performed by Cambridge's Shadwell Opera, also with a church as the venue) was my favourite of the night. Excellent stuff. Very merry here and there, and very sad in other places. It was performed by the other young man, Jerome, whose voice I found to be even richer and more comfortable to listen to, and again with a certain amount of acting. Next were two songs by Ralph Vaughan Williams, "The Vagabond" (text by Robert Luis Stevenson) and "Menelaus" (text by Ursula Vaughan Williams). Also not something I have heard before, but quite enjoyable, in particular The Vagabond. Being a physicist, and not a student of the humanities, I tend not to think about these things too much, but according to Camilla one could really hear the rythm of a person walking throughout. I suppose I shall have do listen to it again. After this came Don Quichotte à Dulcinée, which is a set of three poems by Paul Morand, with music by Maurice Ravel, and which is appearently unrelated to the multitude of operas, ballets and other works inspired by Don Quixote. The music was written for a film version of Don Quixote in the late 30s, but music by Jaques Ibert was used instead. Again, not something I have heard before, and I didn't really like it that much. Not that the performance was bad in any way, far from it, I just found these songs to be less memorable than the rest of the programme. Last came three more modern songs: "The can't take that away from me", written by George Gershwin, from the film Shall We Dance; "Good thing going", written by Stephen Sondheim, from the musical Merrily We Roll Along and "A Nightingale sang in Berkeley Square", by Manning Sherwin. Apart from Nightingale, which is sung in an episode of Torchwood, I can't say that I remember hearing any of these either before, but according to Camilla I can hardly have avoided hearing "Good thing going" performed by Frank Sinatra. Be that as it may, I greatly enjoyed this more modern end to the concert. As it turns out, "Hot chocolate at ten" runs throughout the festival, but with different music and performers each time. So even if you happen to be reading this in Edinburgh, during the Fringe, it is unfortunately too late to attend this specific concert. I had a look at the programme for the rest of the festival, though, and it looked as if there are several good one still to come. Add in the hot chocolate (which was extremely rich, probably more chocolate than milk), and the nice atmosphere of an old church, and I wouldn't hesitate to recommend these concerts. See www.osp.org.uk/hotchocolate for programme details. While the chocolate wasn't quite what I had expected (I had imagined something slightly less sinful in a church), the music was wonderful. I found the two opening parts (Schubert and Mozart) to be the high point. I am always astonished at finding such voices in young men -- they sound as if the singer should be more or less the size of an elephant (in a good way). But surprising incongruity was the word of the evening (the church managed to be both intimate and grandiose at the same time) -- except in the music of course: I am rarely a fan of the operatic take on Gershwin and the like (I feel it should be more jazzy), but I forgave it all when they both sang ``A Nightingale Sang in Berkely Square'' -- harmony, or (if you will) congruity, glorious harmony. I agree with Tor's recommendation that you go see some of the other concerts if you are in Edinburgh. It costs £8 (less for concessions), but it goes towards renovating the church. And Jerome Knox, at least, can also be found elsewhere at the Fringe, in Opera Sins, which I would be very interested in going to see if anyone will come with me (or I might go alone).